I am trying to use my Arduino Uno to send power from one of its digital pins to a cabinet lock, the cabinet lock is "fail-secure," so you send power to it to unlock it, and it is locked when in GND state. I purchased these, but being new to electronics, when I bought them, I failed to realize that I would need to increase amperage as well as voltage to make the lock function. Alas, I had this lying around. 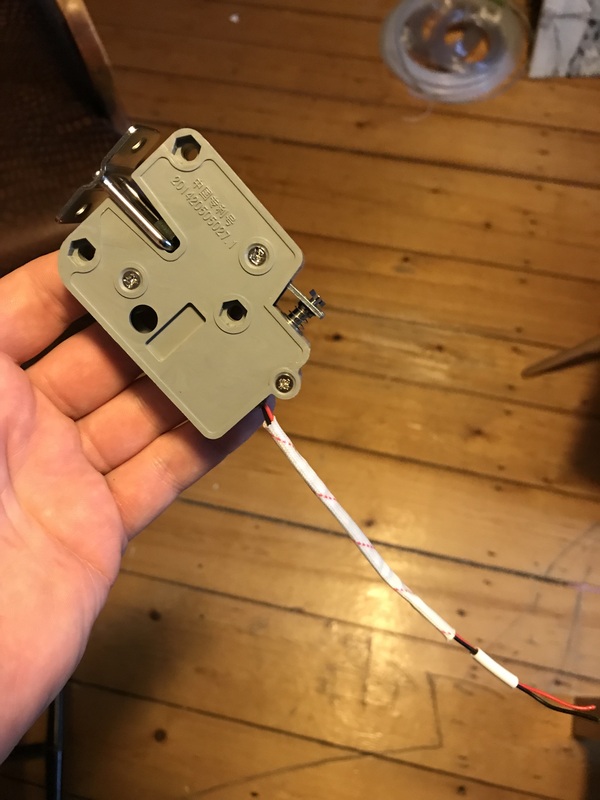 I know it works with DC motors, but I was wondering if I could use it to increase the current for the lock. I'm trying to understand the specs - in some places I see that it can produce 600mA, in others I see 1.2A or 2A. If it can produce 1.2A from 5V, I think maybe that would open the lock (I don't know the minimum amperage that would open the lock). The specs seem to be for two models, I have the L293D. 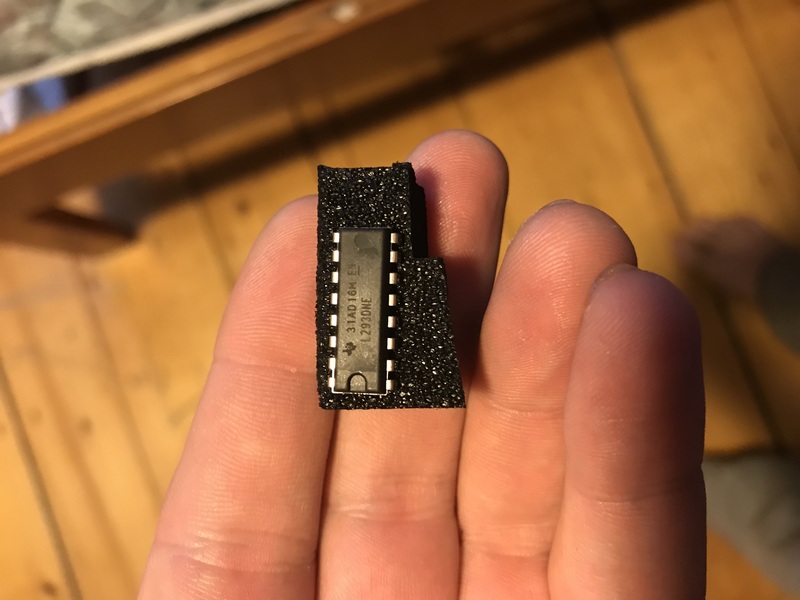 So my overarching question is, can I connect the Arduino Uno digital pin to the L293D and then run the output from that to the DC boost module I got (amazon link above), and then run the output from the DC boost module to the lock...with enough amperage to open it? All you need is a Logic Level MOSFET. I use N-channel AOD5xx to sink current thru a load. 508, 510, 514, any would work well and can be driven from Arduino directly. I use a 150 ohm resistor between Arduino and Gate to limit Arduino pin output current to ~35mA (gate looks like a capacitor to the IO pin), and a 10K resistor from Gate to Gnd to keep the part turned off while the Arduino is booting up/restarting after a reset. I also put a diode across the coil of the latch being driven. Cathode to the 'negative' of the latch (where the MOSFET is connected), anode to the 'positive' of latch. 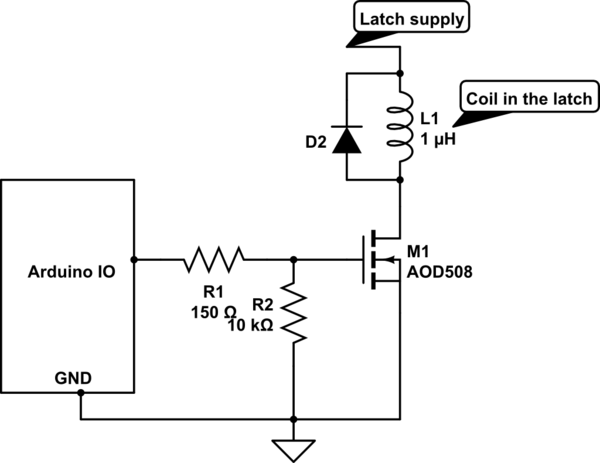 The diode should be selected to support at least as much current as the coil takes to operate. 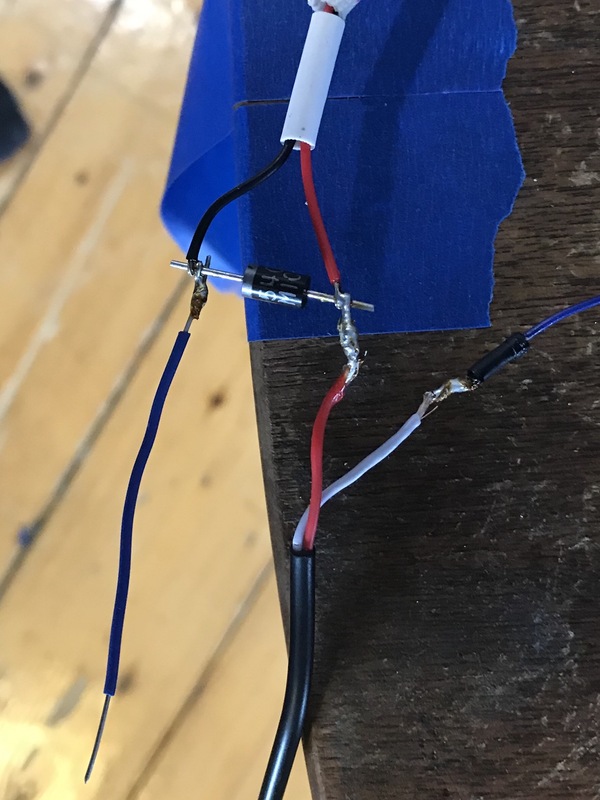 When the MOSFET turns off, the coil will try to keep current flowing as its magnetic field collapses, the diode gives that current someplace to go. Not the answer you're looking for? Browse other questions tagged arduino power driver boost amperage or ask your own question. Arduino Uno with 12V pump: transistor or optocoupler+12V relay? Stepper motor causing Arduino brownout? How can I tell what amperage a 12V rated electrical device will run at 5V?